Happy Friday friends! Did you have a good week? We started out here with some rain and we're ending with a nice few sunny warm fall days. Typical California. 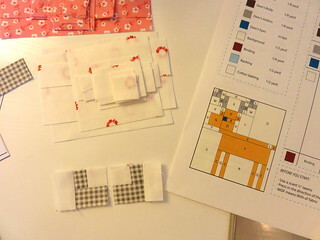 I had the pleasure of pattern testing for my IG friend Mariana. (@sewmariana) I've been following her sewing adventures for quite a while, if you're on IG take a look at her feed, lots of lovely projects. Anyway... her pattern is Dear Dear, and it's going to be available today. I'll have a link for you as soon as she puts it up. The pattern is in full color and it's well done and easy to follow. HERE'S THE LINK TO THE PATTERN! For those of you curious, I LOVE MY IRON SO MUCH. Never have my blocks been so nice and flat. Honestly, best money spent. Of course I know, I know... it could turn on me like all the others but I have a good feeling about this one! That nose was just happenstance.. I didn't even realize it till someone pointed it out. Serendipity. What a fun pattern. Thanks for asking me to test out your pattern Mariana. I really enjoyed it. It's adorable for sure. 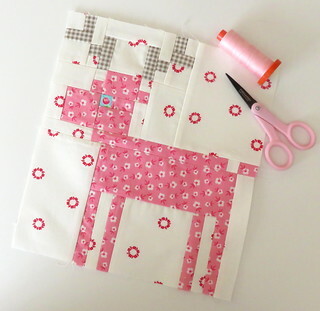 Be sure and check out the #deardearquilt hastag to see more deer! Oh DEER... so cute, but I don't shop at Craftsy. Wish it was on etsy. Love this block pattern. 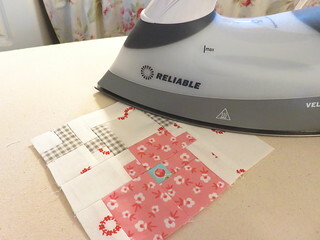 Your block is so cute. Didn't notice the 'nose' till you mentioned it. Pam, thanks SO much for all your support and encouragement!!! Your deer is the cutest ever!!! I love your pink deer.